Montreal is located in the province of Quebec. It's world renowned for its culture and is well recognized as one of the liveliest and fun cities in North America. 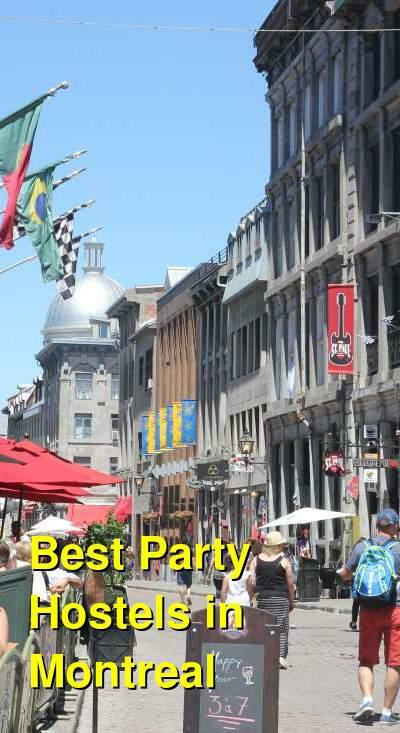 If you're looking for good nightlife and a fun place to party, then Montreal is a great option. The hostels can be somewhat more expensive than they are in Europe, but the atmosphere is fun and the activity level is high. Any of the hostels listed below would be a great option if you're looking for a place to stay with a social and fun vibe. This hostel is a favorite for travelers who are hoping to take advantage of Montreal's famous nightlife. It's a social setting that attracts guests who are interested in going out and having a good time. It's in a great location just a few steps from St. Catherine Street. There's a bar in the basement that is popular and offers some great activities. The comedy show in particular is recommended. The hostel is close to public transportation, and it is very clean with modern furnishings. They also offer a breakfast that is well reviewed. The staff are excellent and know a lot about the area. They'll go out of their way to answer any questions you might have. They keep the hostel's atmosphere light and fun, and its the perfect place to spend a few days while you're in Montreal. There always seems to be something going on and there are no shortage of parties or activities. This is a favorite hostel among travelers who are looking for somewhere social to stay in Montreal. The staff go out of their way to make sure you have a great time. They can give you tips on all the best restaurants, bars, clubs, and more. Don't hesitate to ask. They also organize daily activities for guests which include pub crawls, urban walks, a walk to Mount Royal and sunset walks on Ste-Helene Island. Also included in the price of your room is a continental breakfast. There is a cafe and bar onsite where you can have a hot breakfast, a full dinner, or just enjoy drinks with other guests. You'll also have access to a full kitchen which is already stocked with some of the most basic ingredients including spices, oil, pancake batter, oatmeal, coffee, tea, and more. The general atmosphere of the hostel is fun and welcoming so you're sure to meet other travelers who are looking to have a good time. If you're on a budget and want a social atmosphere then this is the perfect hostel for you. This hostel has been around for 15 years and it remains a favorite among travelers. It has a large refrigerator, and a fun atmosphere that is social and comfortable. It's also a good value for your money, so if you're looking to save some cash, this may be your best option. 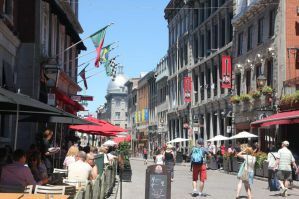 It's centrally located and is close to the arts and entertainment district, old Montreal, Latin Quarter, and Chinatown. There are plenty of places to go nearby including trendy restaurants and bars. There's also lots of great shopping nearby. It's very close to both the bus station and the metro, so traveling anywhere in the city is relatively easy. Other amenities available through the hostel include breakfast, internet service, laundry service and much more.